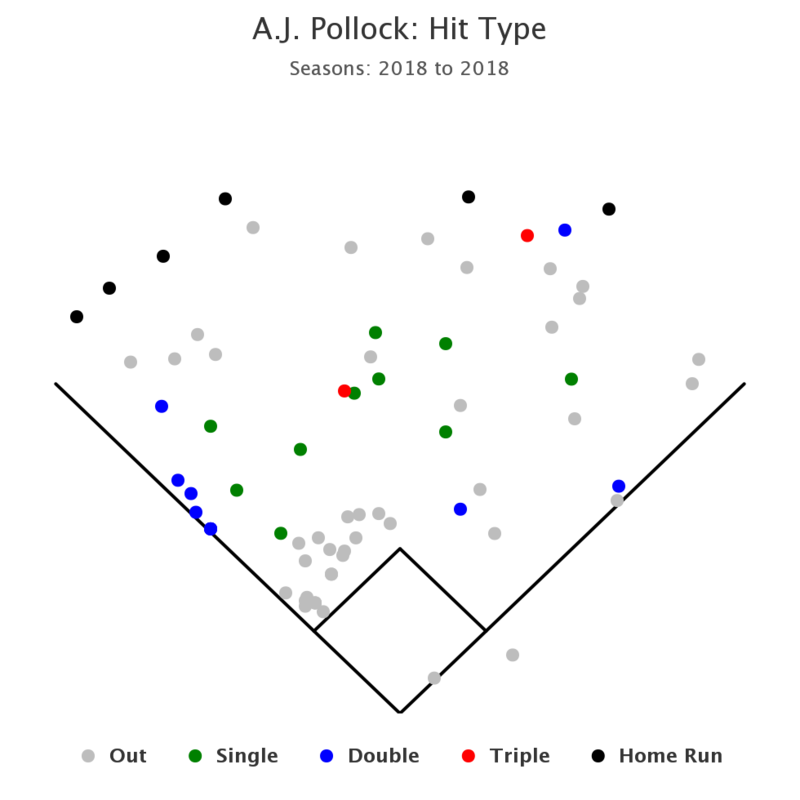 A.J Pollock has been an elite offensive contributor to the Arizona Diamondbacks 2018 record setting start. Of late, the ability for him to drive the baseball to right center field has been a key attribute for his consistency. In this player profile, we take a look at some key elements to his swing with a video analysis feature. With a Hard-Hit % of 45% to this point of the season, it suggests that his consistency and ability to maintain direction has allowed for expanded gap-to-gap power this year with 16 of his 27 hits coming for extra bases including 6-homeruns (2-RCF). One of the things that jumps out is the early early gather to the center of his body. We can see a larger barrel tilt followed by what looks to be a separate gathering of the barrel slightly before his hands work up and back. What is extremely consistent is the positioning of his lead elbow through this process which allows for the hands change direction as the stride (forward move) take place. While there is not a direct flow of momentum from the barrel working from the initial gather to the hands working up and back, his ability to control the barrel sets him up for a tight barrel path. From the lower body stand point, A.J has a larger leg kick which from a timing perspective matches well with the tempo and style of the upper body and lead elbow leading to strong "front-side connection". This allows him to get against the rear leg and build tension as he strides. Part of what I believe makes his swing so efficient is his ability to maintain internal rotation of the hips for a much longer period of time. This allows to A.J to store that energy and torque in the rear leg longer as he works through the recognition phase of his swing. As far as barrel path and swing arc, A.J has been doing a terrific job controlling the arc of the bat maintaining a tight path through the hitting zone. This, like so many other high-level characteristics is what allows him to maximize the time he sees the baseball as well as the ability to adjust to pitches on the outer third of the plate. The barrel release around the hands allows him to accelerate the bat head from the "inside" or deepest point of contact out without compromising his direction. We see this as a swing that carry's more "North to South" rather than with "East to West" swing direction.